PORTAGE – Lulubelle “Lu” McCormick (nee Christensen) passed away peacefully at Divine Savior Hospital in Portage on Tuesday, March 12, 2019. Lu was born on July 21, 1933, in Westfield, the daughter of Arnold and Lila (Russell III) Christensen. Lu graduated from Westfield Union Free High School in 1951. She married James Edward McCormick on October 31, 1953. While serving in the U.S. Air Force, Jim became ill and passed away on July 2, 1956. She moved to Corpus Christi, TX, in 1975, and then to Portage in 1995. Lu was a seamstress/dressmaker and an active member of St. Dennis Catholic Church in Madison. Over the years, she was a volunteer den mother for the Boy Scouts of America, the Latin American Mission Program (L.A.M.P.) where she taught sewing, Red Cross Hurricane Relief Programs, and most recently with Court Appointed Special Advocates (C.A.S.A. ), working with troubled teens. She is survived by her sons, Edward and David (Patti); her brothers and sister, Gene, Bob and Della Christensen; grand and great-grandchildren; other relatives and many friends. She was preceded in death by her parents and her husband. 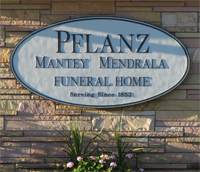 Visitation will be held from 9:00 a.m. until 11:00 a.m. on Wednesday, March 20, 2019 at the Pflanz Mantey Mendrala Funeral Home, 430 W. Wisconsin St., in Portage, with a Memorial Service immediately following, with Fr. Gary Krahenbuhl presiding. Inurnment will be held at 11:00 a.m. on Thursday, March 21, 2019 at Resurrection Cemetery in Madison, with Fr. Joji Reddy Allam presiding. In lieu of flowers, memorials may be made to McArdle Laboratory for Cancer Research, 1111 Highland Ave., Madison WI 53705 or Wisconsin Division of the American Cancer Society, 725 Heartland Trail, Suite 301, Madison, WI 53717. The family would like to express their gratitude to the staff at Our House and Tivoli for their special care and support of Lu.